Meniscus root repair and meniscus allograft transplantation are challenging procedures which provide the goal of restoration of knee kinematics and prevention of future knee osteoarthritis. 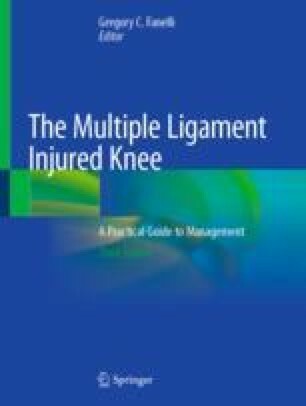 In the setting of a multi-ligamentous knee injury or reconstruction, the long-term outcomes of either procedure are relatively unknown. A meniscus root repair can be essential to prevent increased strain on reconstructed cruciate ligaments as well as to normalize contact pressures within the tibiofemoral joint cartilage. While in the setting of meniscal allograft transplantation, important factors to consider include: alignment of the lower extremity, degree of cartilage wear based on the Outerbridge scale, and graft factors such as size, method of preservation, and fixation technique. Patient factors such as excessive body mass index and smoking may be relative contraindications. Staged procedures including osteotomy may be indicated to improve outcomes from meniscal transplantation. Both open and arthroscopic techniques can be used for both of the above procedures. Limited clinical evidence exists in the literature regarding outcomes for these combined procedures.